With the Wii U boasting HDMI output and full backwards compatibility with Wii games and accessories, some had hoped the new console would be able to make existing Wii games sharper, but Nintendo has reconfirmed to Wired that it won't. During a hands-on session at CES, Ben Kuchera was told that the Wii U "will not be able to improve the resolution" of Wii games, meaning there'll be no Super Mario Galaxy in 720p. Nintendo originally quietly confirmed this at E3, but it's worth bringing to wider attention. Considering Wii emulators are able to display games in 720p it's disappointing that Nintendo's own console won't make legacy games look better. Is this a cost issue, to pave the way for a selection of HD Wii U remasters or something else entirely? Let us know what you think below. I could see them re-releasing certain Wii titles as HD versions. Seems silly not to include upscaling. Nintendo SHOULD address this. What possible reason could there be for this not be a feature? Is it an componenet issue, i.e. having to add more which would bump up the price? Either way, if this was a feature you would bet your life that practically every happy Wii owner would upgrade as a result of this being included. @Corbs - Ah, there's your reason right there. Dammit. I like the tag "Disappointment" on this one. I'll be buying a Wii U to play Wii U games. Whoever thought the Wii U would do this is weird. The 3DS doesn't!! So why would you think differently about the Wii U? Just be happy that you are getting a new system!!! I was really hoping they were going to make the U able to upscale games. I can't imagine it would cost loads or be really difficult when you consider how cheap DVD upscalers are now. But I guess it is good that they're trying to ensure the new system is affordable. It is going to make it considerably less tempting for people with lots of Wii games, though. The usual shoe thrown to users from nintendo. Remember that this is the same people that did a new wii "restyle" which main feature is that hasn't the backward compatibility with gamecube games. What'd you expect from them? oh nooo, boo Nintendo! If my PC can do it, why not add it to Wii U?? Too bad, but that doesn't surprise me. Textures usually only looks acceptable when in their intended resolution. Just check out the HD-footage of Wind Waker. isn't the reason because the wii u is using certain specs. unlike that Pc program that is needed for bleeding edge specs. and even on that program optimization for everygame is different. Pfff, if you got a 1080p LED/LCD and have it set properly Wii games still look beautiful at 480p. Kirby's Return to Dreamland & kirby's Epic Yarn look gorgeous on my set via component cables when set to Fullscreen in widescreen however they look crappy because that is not the Wii's native res. Comparing Wii games to Xbox 360 and PS3 games in true HD isn't even close. Not even in the ballpark of the vicinity of close. After seeing Wii games in HD on the emulator, I sooooo wish Nintendo would put in some type of upscaling. This is lame.I really wanted to play my favorite Wii games without blurriness. I really don't care. I've never seen HD TV as much of an upgrade over SD TV, anyway. By the time I get around to getting a Wii U, my parents might finally decide to get an HD TV, but I'll be living on my own at that point without access to an HD TV. I just hope Wii U games don't look really muddy with hard to read text on a CRT set like some XBOX 360 games do. Considering how amazing Wii (and Gamecube) games can look with emulation on PC, it's really disappointing that Nintendo won't include graphics processing abilities. For those interested, do a google for Super Mario Galaxy, Wind Waker, F-Zero GX, Skyward Sword or Xenoblade HD screenshots. They look incredible. I'd prefer a game to be remade in HD. Upscaling is only a halfway house. @Corbs, that's because you're playing your Wii games set to widescreen. Which gives you a soft & craptastic picture with weaker motion handeling on top if it all. Kirby's Epic Yarn looks gorgeous for ex in 4:3 on my LCD...Widescreen not so much. 'there' i would agree with you that PS3/XBOX 360 wipe the floor HD wise. On a Plasma however, Wii games don't look as clean, crisp and sharp....So the difference between HD graphics is even more stagering. Art direction comes before shiny HD graphics and epic yarn. But whatever, we'll all be gushing ounce we see Mario in 720p HD glory, 'true' widescreen(And not stretched anamorphic in the Wii's case) via HDMI with NextGen Wii U graphics. I had really hoped that they had gone back tot the drawing board on this since E3. Its a huge disappointment. Not only to improve the looks of the games, but because some, such as Sin and Punishment 2, would play better in HD, I think. The 360 doesn't upscale original Xbox games and the PS3 doesn't upscale other games either so why should we expect the Wii U to do so? @WaveBoy Do you mean set to widescreen in the Wii options or on the TV options? Most TVs (including old TVs) resize the image based on what is being fed into it. My TV does that and it's five years old. My Wii games look fantastically pin sharp, bright, and colourful. I'm in no way complaining about they look on my TV. Certainly not the jagged blurry mess some people seem to complain about. I have my Wii options set to EDTV 480p, 16:9, and use the official component cable. We still play NES games, I don't think playing Wii games with the same resolution we always have will hurt us..
@taffy Just because everyone else doesn't do it doesn't mean it's not a good idea and you shouldn't implement it. That's how you innovate. Otherwise we'd still be playing Space Invaders in a smoke filled arcade. Like 17 said, the explanation is likely that they will not be emulating these games via software, but instead will have some sort of legacy Wii-mode the system will go into when launching old software, much like the Wii goes into a GC mode or the 3DS goes into a DS mode (thereby disabling advanced features, wireless, streetpass, etc). Nintendo has continually disappointed with simple stuff like this in it's last few consoles. In your Wii Display options, set it to FullScreen and set your HDTV to 4:3/Full screen and whalla, you get 640 x 480p which is a native FullScreen image which is what Wii games really are. I don't know how anybody can stand playing wii games in Widescreen...Looks pretty crappy in my opinion. Based on my comparisons, there's a bigger noticable difference on LCD's then there are with Plasma's when doing this. On smaller HDTV's like on a 32" getting away with the Wii in Widescreen isn't too bad at all actually, but still fullscreen smokes it on an LED/LCD. Games like New Super Mario Bros Wii, DKCR, Kirby's Epic yarn and Kirby's Return to Dreamland sport those annoying Black bars on the top and bottom of the screen if you play it in fullscreen on your Wii. To ditch the bars, all you have to do is set your Wii to widescreen and your TV to 4:3/Fullscreen and you get a 'full' fullscreen image. It may slightly look like it's being squeezed in, but it's next to unoticable on my set. HDTV owners need to turn off that horrible & artifical gimmicky 'edge enhancement' option as well... Wii games look hella ugly and jageddy when it's on. Dynamic Contrast should be set to 'off' too. Also the people complaining that Wii games look soft and jaggey are hands down playing the Wii on widescreen...It's not true widescreen folks, it's anamorphic...It's soft, especially on larger displays and the motion handeling is weaker. They might even have the edge enhancement turned on as well to make matter worseO haha. The Wii doesn't look soft or jageddy at all in FullScreen...It looks clear, crisp and incredibly beautiful on my LCD. I'm still in awe whenever i play Kirby's Epic yarn. /me reads topic ........Wait....just WHO thought this was a possibility???? Thank God, since I might buy a PAL Wii U and I have a NTSC Wii so I would be annoyed if there was a reason for me to play these Wii games on the Wii U and I couldn't. On that note, hopefully it won't be region locked. I use component cables myself for my Wii. If the Wii U doesnt atleast make regular Wii games look like component cables would(better) then i may get somewhat annoyed, but wouldnt change anything. I like the idea of Wiimakes(remakes?) in hd . @WaveBoy As long as a component cable is used the picture will be 480p whether it's in 16:9 or 4:3. My TV displays the games without any borders in 16:9 unless borders are introduced ala cutscenes in Skyward Sword. Wouldn't it being outputted through an HDMI cable just make it look better in general or no? And this may be a dumb question, but does the Wii come with composite or component cables? but 480p has nothing to do with widescreen. That's just progressive scan, as in a clearer/crisper image that runs in full 60 frames per second. And there shouldn't be any boarders from the top and bottom of those games i mentioned when wii games are displayed in 16:9. That's how they are in 4:3, unless you do the Widescreen + full screen trick i mentioned. You should try 4:3 on your HDTV + Wii for yourself to see the difference. I'll never play the wii in widescreen again, as it looks pretty damn terrible. Luckily I have bad eyesight so I don't notice anyway! Of course it works good with games like Super Mario Galaxy, which mainly consists of shaders. But what's with games that have a lot of textures? I don't think they're that easy to upscale. I wasn't expecting any type of HD upscaling as Nintendo is always lame about such things, but as emaan1 said, I would expect at least an increase in PQ going from the Wii w/ component to WiiU w/ HDMI equal to Wii composite to Wii component, which anyone who tried it with LoZ:TP knows was an obvious improvement. Plus the horsepower involved should help with framerate issues, slowdown and other technobabble I know little about. How much more would it actually increase the system price to make this work? The only reason I could think of would be that perhaps making a sharper wii game would actually make it look like crap. Take skyward sword for instance. They could feasibly make characters and foreground look better, but because of the way the background is blurred, sharpness may simply reveal more pixelation. Since some developers were able to max out the system's capabilities, some graphic code could have been left out to make the best product possible for a disk of such low storage space. I could see Mario galaxy looking great, but skyward sword would look awkward. Since there would be no guarantee as to the visual quality across the board, they may have declined for that reason. The more I hear about Wii U the less I want one. They pretty much lost me at the controller. Unless the resolution is already on the disc, each game would have to be patched in order to up-res to 720p or higher. That's equals time and money. And upscaling isn't really even that big of a deal. Plus, if Nintendo just let all their old games play in HD out the gate, why would people buy Wii U games? They would drag out the sales of games we've already played and beaten for years now, Wii U software sales would suffer, and new games would be slower or less frequent to release. I don't want Nintendo spending time and effort on the Wii anymore. I want them to put everything toward the 3DS and especially the Wii U, and I want that thing to come roaring out the gate. New games, new experiences, all in beautiful 1080p. I don't want a reason to play my Wii games once the Wii U comes out.... unless I'm feeling nostalgic. @Portisanta I'm sort of wit you on that. Maybe I'm not as techy as other folks but I don't see why anyone would have been expecting that. The PS3 didn't do that with PS2 games if I remember correctly. So, it makes sense that like Sony Nintendo might release HD versions. So much ignorance out there on this subject. Yes, emulators can increase resolution of Wii games, BUT it rarely runs games %100 properly and some games don't even work at all. Not to mention it takes some pretty high end PCs to do just that much. It's not so much a cost issue as it is a compatability issue. It would be a PR nightmare to impliment a feature that would only work on a small percentage of games. I'm just happy we will get to see Wii games running through the cleaner output of HDMI with digital PCM audio. It's somewhat of an improvement at least. Guys, the reason this won't happen is because upscaling doesn't work for many types of game graphics. It's been mentioned that some 3D games seem to upscale well. I've seen Super Mario 64 played in upscaled emulation, and the 3D polygons had obviously sharper edges. Any 3D hardware can render a scene to any size display and get a sharper image for larger displays. However, certain elements looked horrible. The GUI, which is made of 2D fonts and icons, looked horrible. You can't realistically upscale 2D images, because the individual pixels have to either get directly magnified (and look blocky compared to the sharper 3D scene), or smoothed, which makes them fuzzy. Other elements are in between. Textures will look essentially the same, since there is no more detail in the texture to magnify, but it won't look any worse because 3D textures are already filtered as part of the rendering process. Some elements would probably fail disastrously. Any game which uses a full screen post-processing effect, such as blur or lighting bloom (used in Twilight Princess and Mario Kart Wii, or my studio's recent Big Bass Arcade for WiiWare), will probably not upscale at all. The reason why is that the initial scene is rendered to a FIXED-SIZE image in the system memory, and then this image is modified using special techniques, and then the final result is copied onto the screen. The only way to upscale properly would be to modify the code to use a larger internal texture buffer, which may not have even been possible when run on the original hardware. A game using this technique would look NO DIFFERENT with hardware-only upscaling applied. These reasons mostly apply to DS games as well. This is why when you play a DS game on the 3DS you have a choice between using the original resolution, or a larger version that is a little blurry. 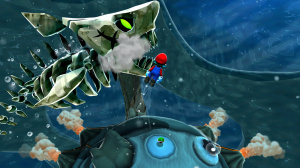 The larger version is upscaled naively after the display image is completely rendered, and is the best that can be done without modifying the original game code. Isn´t it obvious that Nintendo will re-release it´s major games in HD? I don't even own an HD TV, so I don't care. This doesn't bother me much, what I would get angry about is if the Wii U wasn't backwards compatible. By the way I don't have HD tv yet (probably the reason wy I don't care) if I don't have HD will I even be able to make a Wii U work or would it work but with lesser quality? @Arkaein: Thanks for explaining that. Ha, oh man that just made me laugh. @Arkaein Thank you Arkaein for the explanation. With the fuzzier font and the strangeness with the post processing stuff it doesn't seem really worth the time and effort to actually do this. None of this is consistent between each Wii game either; as Rapadash6 brought up earlier this could result in a pretty small list of supported games. Better support for all Wii games then something minor for a rather small subset of games. I hope this actually clears things up for everyone whom actually look at this article. Nintendo doesn´t like to be a better company. This probably means they're going to release HD ports of all their games. Such a shame, I though Nintendo was a better company than that. I can already play all of my Wii games on my PC at 1080p, so needless to say I won't be re-buying any of them. @Arkaein: Thanks for the explanation. I can see there is a lot of ignorance here. People have seen screenshots and such of Wii games running in HD on emulators which actually comb through the code and run texture resolutions at what they really are on the game disc, which is often higher than what the Wii outputs to your TV. The Wii itself renders the textures to 480, whether they are higher rez or not. It would require work on all the individual games to get them to look as nice as those PC emulators people have seen (not to mention a lot of extra processing power). A simple upscaler wouldn't look nearly as good. It's not as if DVD upscalers suddenly give you Blu-Ray quality from your regular DVDs. There is one particular reason why Nintendo does not want to upscale games. Some of them, like Skyward Sword for example, use various effects that are hard coded for 480p. This is why latest Zelda installment does not show depth of field effect in Dolphin - the shader is written to work with only one specific resolution and it won't render properly with any other. Fixing that would require quite a bit of coding and it's simply not worth it. And besides - what is with that upscalling stuff anyway? I always saw it as pointelss, even in case of movies. If something is great in low resolution, why do we need to upscale that? Won't change a thing... So bottom line - I don't really care, resolution means nothing. Meh, I have a 19in LCD HDTV with my Wii while using component cables. It has a decent resolution and the handful of Wii games I play look great on it. A Boy and His Blob,Blaster Master Overdrive,Castlevania Adventure Rebirth,Nights. I think you're all missing the point here. HD Wii games would be a MASSIVE selling point for the Wii U. And it's far from a figment of peoples imagination. If any of you take the time to look at the dolphin emulator then you will understand, the quality is AMAZING. You're saying that it'll be too buggy? This is Nintendo we're talking about, they know their hardware better than these guys so Nintendo could emulate the Wii perfectly. But there are reasons of course. What is with you people? Does resolution really matter that much to you? All HDTVs and Projectors upconvert the signal to their native resloution for you. It might not be as good as the method you are complaining about, but why do you care so much? Does beautiful graphics make the game that much better? I play my Wii on a 97 inch projector, and it looks fine. If it was native 1080p graphics, it would not make the game any better. I still feel that some of the games I played back in the SNES era were better than any game I have played thus far. Those graphics were horrible compared to now, but the games were awesome. They are ingrained in my memory too this day. Graphics don't make a game, gameplay does. Just for your information my Skyward Sword game on my projector output from my Wii looks nearly identical to those videos posted in previous comments. So why not just live with upconversion by your TV, and enjoy the game the way it is. bowlerchris. Of course the image would be better if it was 1080p. No upscaler is that good. No one is saying graphics trump gameplay. What people are wanting is something very reasonable. As for your projector upscaling, that does it post rendering which isn't the best way of doing it. The way an emulator would do it is by physically rendering the game at a higher resolution, which will look 100x better than post upscaling. Don't get me wrong, the games play great regardless but some games would really benefit from having higher res graphics. Surprisingly games back from the SNES era scale very well. It's when we started hitting 3D that games start to look very aged. Boot up your N64 and it will run like a bag of by todays standards, to the point of being uplayable. Of course the Wii is a different story, but having Wii games in HD is not a silly request. I should say, to all who are whining, that it is a phsyical IMPOSSIBILITY to take a standard Wii game and output it in Hd. Flat-out impossible. The stuff you see on emulation forums takes a lot of work and some serious meddling. It's not as simple as picking up an HDMI cord. how many of you guys have HD components for the wii ? i do and it makes a big difference. i kinda get the feeling that some are still playing on standard def which is fine too. I'm disappointed. That is all. I'm sorry but this fullscreen thing you speak of is just not true at least not in my setup. To set a 16:9 HD TV to fullscreen for Wii games does not enhance the graphics if anything it just makes them 'smaller' so things may look clearer just by virtue of being smaller. I have a 65" 16:9 hd set and I've had it set both ways (with component cables) and proper widescreen is crystal clear and motion is always superb. Full screen looks a bit jaggy just because about a 3rd of the image is gone once the sides are cropped and there are bars on top and bottom. The games are designed to be played also in 16:9 (at least most of the recent ones) so maybe it is anamorphic (I know the native res is 4:3) but it's not "stretched" and to put your games into fullscreen mode just to gain the tiny bit of extra jag in the native SD image is not worth all the cropping that happens. That is not really great advice for someone who just wants the best their TV can deliver all around. I'm sure theres a difference if you take a magnifier lens to it but I've looked close and it's pretty minor. The noticeable difference is really only from using composite cables. Anyhow, it's not a big deal to me. 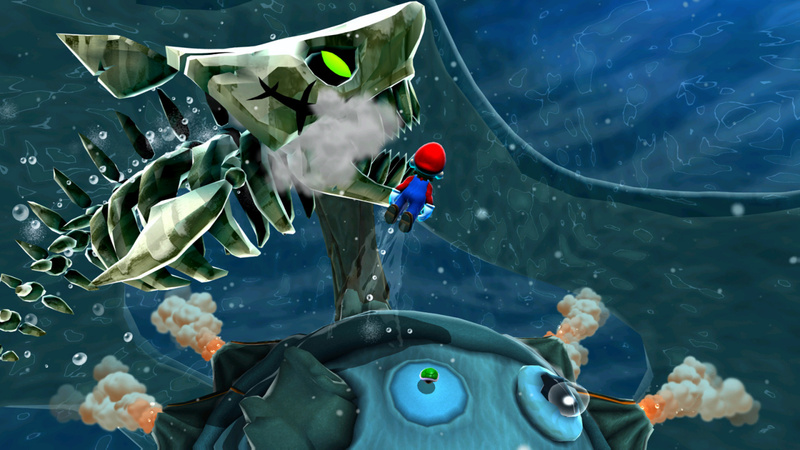 But Mario Galaxy looks beautiful as is. It looks even better in that screenshot (and shows that the Wii is indeed powerful- it's all about the resolution). i bet even though they say it wont look better ..they will..
i mean the signal will be passed through HDMI...they just saying it wont to cover their butts because im sure the difference will be small...but will look a bit better.. I played my Wii games on a HDTV. I played my PS3 games on a HDTV. Both around the same size and it still doesn't matter to me. Both play games, and I'm good with that. Doesn't matter to me if Wii U doesn't upscale. Even though they say that, the simple act of putting the signal through a HDMI cable will improve the sharpness noticeably because when a signal is sent through a component cable, some of the signal is lost. Using a HDMI cable on the Wii U should have a similar effect to that of using an upscaler. Upscaling is unnecessary. My HDTV set does just as good a job upscaling a native 480p signal as my upscaling DVD player does. People seem to forget, emulators support the FX chip in SNES games, but the Wii emu doesn't either. Makes me wonder if Nintendo was lazy or they lost the original instruction documentation for the chip. However, the Wii does upscale N64 games to 480p resolution. Even with the stock composite cables, N64 games look far superior on the Wii than on original hardware. And old VC games (except N64) exhibit the same lagging, sprite flickering, and other graphical artifacts of the original games; they just look 1000 times sharper with component cables. It's quite possible that running Wi games in 720p natively would require allocating additional RAM and overclocking/exceeding the original design specs of the Wii hardware, and that could potentially produce unwanted artifacts or game glitches not present when run in standard mode. Even if the Wii-U hardware could potentially allow native 720p support, if doing so breaks just 2% of existing games by enabling this, then it could trigger a fan backlash. I really don't give a crap to be honest. I'm getting the Wii U for Wii U games, not to play my Wii games. That's what I have a Wii for folks. while im not really dissappointed by this, it would've been a great inclusion. however, i'm not surprised...i think they might be purposely leaving this out to potentially release HD versions of Wii games. Let me put it in perspective. Xbox 360 is a generation greater than xbox in graphics, and is in HD. But the 360 does not have the ability to upscale xbox games into HD. Given that the Wii's graphics are considered to be gamecube 1.5 (basically just a bit better than the previous generation), let's round down and simply consider it to be part of last gen's graphics. Wii U, let's consider part of the 360 generation graphically (being modest! We all know it'll be much better! i hope!!) asking the wii u to have upscaling for wii games is like asking the 360 to do upscaling for xbox games which it does not do, so i'm not surprised. furthermore, both sony and microsoft's current systems have released individual games and bundles both via download and on retail discs of last generation's gems in HD. I can foresee nintendo doing this with perhaps some of the hidden gems on the wii that never got the limelight they deserve...i doubt we'll see super mario galaxy 2 rereleased, because we are going to have a brand new ground up truly next gen mario game in full 1080p HD. It'll look way better than the upscaled screenshot of SMG2 included in this article, we can all count on that. At the very least, i expect the Wii U to be equal to an xbox 540, so to speak. the next gen efforts of sony and microsoft may still beat out wii u in terms of power, but we all can count on the wii u making current systems look like yesterday's news (which it is at this point). What i do have to say though is i can understand why some people might have expected this of nintendo even when no one else did it this generation when they went HD....it's because nintendo fell a generation behind in power...so when everyone is playing skyrim on their 360s in glorious HD, we're playing skyward sword with jagged edges in a lousy 480i or something. perhaps wii owners feel cheated...like the wii games we all love regardless of graphics shouldve originally been in HD anyway to keep up with the competition, so now nintendo has a chance to not only play catch up with sony and microsoft but also make amends for being a generation behind for those of us who rly are graphics fanatics (cmon, we all love a great game but we are all suckers for gorgeous games! admit it!) and also, if it did include upscaling, i bet you a lot of ppl who wanted a wii but never got one because they only wanted to play a couple games (mario, zelda, etc....i only have a handful of wii games myself they are all first party titles. if my wii wasnt given to me as a gift honestly i might not have ever gotten one) the couldve bought a wii u AND gone to the back catalog of wii games and picked them up which they still can do since its backwards compatible but it wouldve been a big incentive if they upscaled too..then nintendo wouldnt need to do any rereleases in the future, they could keep printing the original wii disc..no extra work on their part. but whatever. ive ranted quite a bit, apologies. Really there is no good excuse why you can't play Nintendo games in 720p. Just like why there is no excuse why we can't play Super Mario World 2 on VC. It's very possible, they just don't do it. All the technical excuses are just that, excuses. If they really cared about it, that Wii or Wii U would have the hardware/software needed to do it, it's just not a priority and they never cared about HD. Nintendo is only joining the HD world now as really they have no choice at this point. If they wanted to be cutting edge, Wii would have been HD from the start. And the other consoles do in fact upscale, I've read that Halo is sharper on 360 than running on Xbox 1. And for those who claim you can't see a difference in resolutions, your TV is too small or your blind. That's like saying the movie theater does not look better than your 480i TV. It does, that's the resolution and size at work more than the projector - you need both size and resolution - think 47"-55" at least. Whether that increase in resolution matters to you for the less textured Nintendo games, that's another story. But for heavily textured games like Uncharted or Blu-Ray movies, HD resolutions are a massive improvement on my 47" HDTV. It's the same reason why Nintendo fell behind on internet support and the digital space, or even voice acting. They need to step it up or they will always be the second box next to the main system for a lot of gamers. @Corbs Even if Nintendo don't put in on-console upscaling, your TV will do it's own upscaling. What you are really asking for - talking about Wii games in HD on an emulator - is re-rendering at a higher resolution, which is what I think Nintendo have said they're not going to do. Aaahhh, some of these comments have too many words, its making my head hurt. Sorry Ren, but you're wrong. This little 4:3 & 16:9 issue has already been brought up and disected to death on the AVS forum by tons of users months after the Wii was released. It's common sense. Again, wii games are '640x480' that's a Full screen 4:3 image....What happens when you set a wii game to 16:9/Widescreen, is that it doesn't add more pixels to each side of the screen because the ratio isn't widescreen to begin with...it basically stretches and slightly enlarges the image to fill the sides of the screen and that's where a bit of resolution/crispness and clearness loss comes into play. It's common sense with anything. Weren't you saying you had a none LED/LCD 50" + HDTV....well, there you go. It's your set up. I've tried this little trick on more than a few hdtv's and i can tell the difference, and so can everybody i showed it to, 16:9 looks soft dude in comparison 4:3 on LCD's and LED's. On a plasma it's still there, but because Plasma's have video noise which is inherent to the technology the image isn't quite up to snuff when compared to an LCD/LED as far as cripness, sharpness and looking clean goes. All displays vary i guess. So yup, i'm not giving out false info, only the facts again which have been stated by tons of people, many of which are pretty damn tech savy and know what they're talking about. You're giving out false info by just basing your opinion on your HDTV. it's a fact jack! If you can play it on your PC, then play it on your damn PC. OMG, you guys are getting greedy. That is bothering me, society always wants more, more and more... never satisfied. If you want it so badly, study and be hired by Nintendo and then do it and get lots of money and have no time to breathe. Why the heck not?! The Xbox 360 can upscale Xbox games to 1080p! ...Oh well, no Skyward Sword in HD people. I agree. And I could care less if Wii titles ever got an HD upgrade on the Wii U. Why? Because after you experience Wii games 'turned to HD' you'll hate Nintendo even more for not making the Wii 'HD' in the first place. You'll wish you had experienced the games you did in HD. I'm fine with 480p being upscaled to 1080p. Anyways, Wii games still look solid in 480p(on a 1080p LCD/LED) in 4:3 when you have the PQ set up poperly. Kirby's Return to Dreamland is lookin' mighty gorgeous on my set. I suggest everyone actually read Arkaein's post before any further posting. Because quite frankly, a number of these things have already been addressed in their post. Also, upscaling does not equal making things sharper. Those are two completely different things. Yeah, Arkaein's post is spot-on. It's either impossible or would require so much work and maintenance that it'd just not be worth it on Nintendo's part. We'll probably get some HD remakes of the really great games anyway, and probably with added content. HD remasters seems like a likely scenario. The sad thing is I will probably shell out for whatever remasters they do in fact come up with (especially if they are in collections, not unlike PS3 has). Some of you people are silly. Upscale is a halfway house? wtf? Running the Wii at 720p is not upscaling, the game would be rendered at 720p reducing aliasing and such unlike a DVD that can't really have any extra detail pulled from the 480p picture. The most likely reason we won't see this is because they will probably do what they did with the Wii backwards compatability They will run Wii games in Wii mode which will lock out any of the more advanced hardware. Disappointing? Yes very much so. HD is nothing special? Hmm well Wii games look fine on your SDTV from 1994 they certainly don't look great on a TV made in the last couple of years. Even on my small 32" HDTV they aren't very nice to look at. If you keep your distance it's not so bad but bump them up to 720p and I have no complaints. "i bet even though they say it wont look better ..they will..
i mean the signal will be passed through HDMI...they just saying it wont to cover their butts because im sure the difference will be small...but will look a bit better.."
Even though games may indeed be displayed in the same resolution, they will look sharper because of the usage of a HDMI cable. It'll be weird if not. Meh... Haters gonna hate :3. So Motion handeling aside which is where CRT is KIng, plus Plasma being not too far behind...I'd say that Wii games do in fact look much better on an LED/LCD HDTV using compoent cables and when set up properly. Progrssive scan plays a big part obviously. Plus video noise is inherent to CRT technology so you're not getting an image that is quite as clean, crisp or clear as an LCD/LED. Ya, I'm talking about using a set of component cables on both an SDTV and HDTV. Kirby's Epic yarn look gorgeous on my 42" 1080p LCD which is only one ex. on my CRT it's nowhere near as clear(and ya, i AM using component cables) nowhere near as bright and the color gamut is extremely limmited. If anything LCD/LED would be the perfect HDTV to game on if it weren't for the crappy motion smearing/blurring which destroys motion detail....Super OLED fixes this, that's the ultimate HDTV tech which will be released in 55" later this year. Again, nobody should judge how wii games 'look' unless they're displayed properly in 4:3, not this softer looking Widescreen crap which becomes even more evident at larger sizes especially after 32". So Bluh! Enough with this annoying never ending TV talk. I'm gonna go grab my Spicoli surf board and go catch some Snowy Winter Wonderland Waves! Shibby! I'm not saying your wrong i understand the tech behind it and that technically it's a 4;3 image, I'm just saying that the difference is small enough that it's not worth the size reduction to anyone but the most obsessive techie (I edit film for a living and I have to know the technical difference with this junk). Anamorphic by its nature means that the image is NOT enhanced (as you know) but it IS created to retain the the 16:9 frame after the stretch happens optically (or digitally in the case of a tv), which also means that the graphics are (usually) created with a slight horizontal squeeze (in their full native resolution) so that after the 'anamorph' the image looks naturally 16:9. Yes, there is a tiny bit of image quality loss but the graphics are intended to be seen in 16:9. That's great if you must see them in their native resolution but In 4:3 they will be made either much smaller with bars or look a little skinny because it was designed to be stretched that way in the first place (depending on settings as you mentioned). If you must be right, then sure you ARE right, but this doesn't mean it's the best way to view games (on any system) Why would anyone want to cut out so much of their viewing area just to retain the most miniscule extra definition to each pixel? It's not worth it unless you only have a composite connection or something. I'll bet everyone here with a HD tv uses it in it's obvious 16:9 setting, because no one likes sitting 5 inches from the screen to see whats going on. If you expect pixel perfect HD than get a ps3 there will always be some trade off with the Wii, no matter how perfect your set up gets. I do think there is little point to shoehorning 720p onto old Wii games now, but they should of had 720p to start with tho. For anyone wondering why Nintendo might choose not to increase the native resolution of their games, take a look at Microsoft's track record with early XBox backwards-compatibility. Not all games were supported because they had to QA each game to make sure the enhancements didn't break something and that the game still ran at the right speed, and some games looked worse when enhanced. You can't just increase the resolution to HD and not expect some issues. First of all, we should not obsess on trying to play Wii games in higher resolutions. Wii games are fun, and that's really all there is to it. That's why we play them. Not because of kick graphics or high-end technological capabilities, but simply because it is fun. I believe Nintendo deliberately chose not to include this feature so people's attentions would not be on playing the old Wii games again, but instead to keep their focus on the upcoming, newer titles. I know PS1 games looked slightly better when played on a PS2, so it's possible, but as a few people have mentioned, maybe it's down to cost. But I'm not really bothered if this feature isn't included, it'll be great to play Wii U games in HD. When I play Wii and GameCube games on my LCD tele, they do look quite blurry, but they look better on a standard tele. A friend of mine said it's the same case on his LED tele, so I guess old tech consoles are best suited for old teles.